Announcement Love. Joy. Compassion. Equanimity. All of my original one-of-a-kind raku statues, sculptures and wall hangings reflect these basic values. Buddhas, Kwan Yins, Angels, Goddesses -- these figurative sculptures by Anita Feng are created as expressions of peace. Each work of art is made uniquely, and all are formed in clay, then fired using the special raku firing technique which gives extraordinary vibrant colors. My raku glazes are sealed with a special preservative to keep the colors bright and clear. I pack the sculptures with extreme care! If you're in the Seattle area, contact me for a studio visit! Love. Joy. Compassion. Equanimity. All of my original one-of-a-kind raku statues, sculptures and wall hangings reflect these basic values. Buddhas, Kwan Yins, Angels, Goddesses -- these figurative sculptures by Anita Feng are created as expressions of peace. Each work of art is made uniquely, and all are formed in clay, then fired using the special raku firing technique which gives extraordinary vibrant colors. Beautiful, unique pieces that inspire! I think the artist captures what equanimity looks like, as she sets out to do! Wonderfully packaged for shipping, and quick! A close-up of a Kwan Yin descending into the flames. Maker and sculpture see eye to eye on the finishing touches. Lift off! I've lifted off the fiber mesh top to the kiln and in the first instant, the sculptures are glowing hot! With tongs, I lift each piece out of the kiln and insert into a bin filled with combustibles. Fire! Buddha Statues Brought Up to Date! 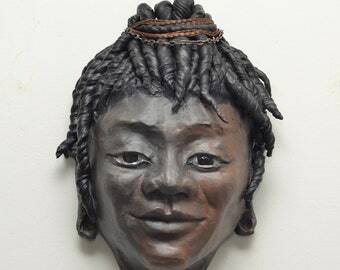 Golden Wind Raku began when my thirty-odd year career as a clay musical instrument maker took an abrupt shift into silence -- the silence of Buddha sculptures! How this happened was as much a surprise to me as to anyone that knew me. A dear friend and fellow Zen teacher, with time off from his work as a set-decorator in LA, asked if he could use my studio to make clay Buddhas for a couple of weeks. Sure, why not? As the days passed, I became more intrigued by what he was doing, and then involved (in helping him understand the qualities of clay, tools and techniques). Then we collaborated on a few. By the time he'd left, I decided to officially retire from instrument-making and devote myself to making Buddhas with what time, health and energy I have left. What a joy to make these one-of-a-kind expressions of fleeting peace and serenity! It turned out that I love exploring the question, "What does a Buddha look like?" and I'm quite sure I'll never come to the end of answering it. 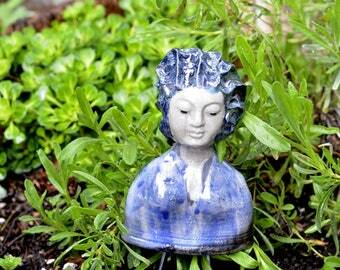 Add together 40 years of Zen training and over 40 years of ceramic work and naturally, you get raku Buddhas! I love the smell of fire, and I love the question: what does equanimity look like? You may display these raku sculpture outdoors, but be advised that I recommend bringing them indoors during freezing temperatures.